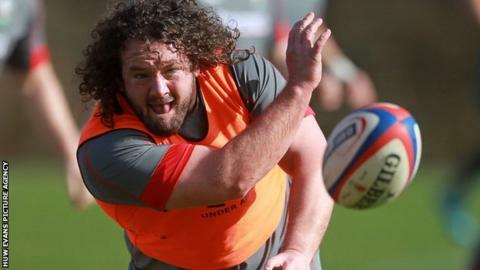 New Cardiff Blues signing Adam Jones has been told to lose some weight by the region's director of rugby Mark Hammett. Wales and British and Irish Lions prop Jones has signed for Cardiff Blues on a one-year deal after his contract with the Ospreys expired. New Zealander Hammett, who succeeded Phil Davies, believes the 33-year-old's fitness is an issue. "He'll tell you himself he's not the most mobile," he said. "That suits our rugby at a certain time of year so we want to make him more mobile in this game. "He needs to shed a few kilos so that's part of what we are looking at getting him to do." Jones left Ospreys at the end of last season and had been in limbo because of the ongoing dispute between the Welsh Rugby Union and the four Welsh regions. But Jones, who has won 95 Wales caps, has instead joined the side from the Welsh capital on a 12-month contract. The signing was prompted by Hammett, who was surprised that a player of his stature had been left in the wilderness.